Naomi Osaka called in her coach for advice on how to swing momentum after losing the first set to Anastasija Sevastova, and it did the trick. Kei Nishikori worked his own way out of a jam against 2017 champion Grigor Dimitrov when he was down a break in the second set of their quarterfinal match, winning six of the last seven games to clinch it 7-5, 7-5. And so after the back-to-back matches on Pat Rafter Arena, two players from Japan, both seeded No. 2, were into the semifinals. 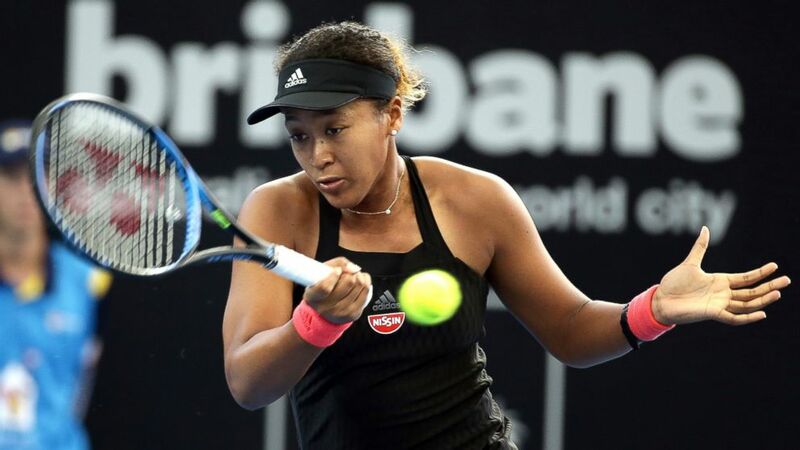 Osaka was clearly under pressure against the eighth-seeded Sevastova, who had won both of their head-to-head meetings last year and converted two service breaks in the first set. A disconsolate-looking Osaka went to a courtside chair at the changeover. And whatever coach Sascha Bajin told her during a quick, animated conference, it worked. She finished with 11 aces, converted all four of her break-point chances in the second and third sets and appeared far more confident in her own game. Bajin, a former hitting partner for Serena Williams, really just gave her a reality check. He told Osaka to stay calm and wait for her opportunities. "She's one of the best players in the world. I just have to stay in there, and hopefully I'll get a chance,'" Osaka said. "I did, so I just kept trying to roll with it. He literally told me that." On-court coaching is allowed at WTA events, but it is banned at Grand Slam tournaments. The 21-year-old Osaka will play Lesia Tsurenko, a 7-5, 6-3 winner over Anett Kontaveit, in the semifinals. She could rise to No. 3 in the rankings next week — which would be a record high for a player from Japan. Osaka has now made the semifinals or better at four of her last five tournaments, a streak that began with her run to a first major title that culminated with a memorable win over Williams in the U.S. Open final. And it has all been a significant boost to her confidence ahead of the Australian Open, which starts on Jan. 14. "I feel like right now I'm really confident in myself, and I feel like the offseason training that I've been doing is really paying off," she said. "And I'm not sure if I would have had the same feeling six months ago. Six months ago I didn't win the U.S. Open." Nishikori, who became the highest-ranked male player from Asia when he got to No. 4 in the wake of his run to the U.S. Open final in 2014, lost the 2017 Brisbane final to Dimitrov. That is so far a one-off, with Nishikori now extending his career record to 5-1 against the Bulgarian. "I'm trying to go (back into) top five, that's my next goal," Nishikori said. "I was playing great tennis (last year) and I think I'm doing it again now this week." He will next play Jeremy Chardy, who beat Japanese qualifier Yasutaka Uchiyama 6-4, 3-6, 7-6 (4) to reach the semifinals. Jo-Wilfried Tsonga got an easier path to the quarterfinals than expected, avoiding a second-round contest with 17-time Grand Slam champion Rafael Nadal, who withdrew from the tournament with a thigh muscle strain on Wednesday. Tsonga then beat Taro Daniel 7-6 (5), 6-3. The 77th-ranked Daniel was the lucky loser from qualifying who got a spot in the main draw when Nadal pulled out.